In honor of those Red Hot Chili Peppers who were in Denver last night but unseen by me, the twentieth anniversary of my relationship with the man who would make me Mrs. Adams, and the fact that I cleaned out my office (the true driving force) I have two things to give away. They are the same thing – Advanced Reader Copies (ARC) of my book. Here’s the thing about ARCs, they are flawed. They do not have Dr. Redmond Burkes fantabulous foreword and they have some typos and errors that were corrected before the final book was published. The book jacket says “Advanced Reader Copy,” there are no photos, and the paper quality is not the same. But, it’s a 97% match for the real book and I have two I will give away for free to people who post a response to this blog post. I will draw two names on Sunday and mail the ARCs on Wednesday (so I can get addressed from the winners) – USA addresses only, sorry. So, want an ARC? Post a reply about why. I don’t need your address yet, I’ll get it from you on Sun/Mon. I have already purchased and read your book but to have an ARC would be an amazing and treasured addition to my book collection. I would love one! I am living the CHD surgery/complication nightmare right now with my baby girl. I would love to read about another mom’s/family’s experience. I’d like a copy. I’ve heard your book is great but previously I haven’t been emotionally ready to read other heart stories. I think I’m ready now. Thanks! I would love a copy,autographed of course…I am a cousin and have followed Liam’s story through your mom, Facebook, Jan Mount and of course my dad, Don Tesch and his wife Sandy! My heart has jumped for joy each and every time I hear that he is doing great! If I don’t win this drawing I’m still going to purchase your book! I’ve heard it is amazing! I would love a copy of your book!!!! Im a heart mom myself, I have a 2 year old daughter wit HLHS and I love hearing others stories!! I loved Heart Warriors. It made me laugh, it made me cry, but most of all it made me feel a connection with someone who has gone through similar issues as a newly declared heart mom. This book helped me to start working through some of my emotions that have suefaced since we found out about Owen’s heart. I became part of the CHD family 8 months ago. My babies therapist recommended that I read your book and lent me her autographed copy. I am currently half way through the book and have found it to be so inspirational, informative and most importantly it helps me relate to someone (which felt almost impossible). My soon is about to undergo his first open heart surgery in 4 days and I would love to have a copy of my own! Thank you so much! I would love a copy! As a fellow heart mom, I always like to read and learn about others experiences. Your book is currently on my wish list… if I don’t win a copy, maybe I will get it for Christmas! I would love a copy, but I would much rather have one of the moms who posted before me (who find themselves smack in the middle of the early years of dealing with CHD) to have a copy of it. I hope they can “win” a copy. I would love reading it. One of my best friends has a baby girl with Shones Syndrome. Im trying hard to raise awarness for CHD through edits and videos. You should see my video “CHD are you aware? Mia Jones”. I would love learning more how life with chd or a child with chd is like because i have only seen it with my friends and her friends with other chd warriors. We joined the CHD family 5 months ago. We were told our baby girl was fine and sent home but they missed her CHD. She got very sick and was diagnosed with a VSD, ASD and PFO at 2 months. She had OHS at 5 months. Her VSD was very large and she was in heart failure. They couldn’t wait and had to do her surgery even though she was only a little over 7 pounds. She has struggled since surgery to gain weight and still isn’t quite 8 pounds at 7 months old. She is such a fighter and doing so much better. I would love, love, love a copy! I have been wanting to read this so bad but have yet to get hands on a copy. 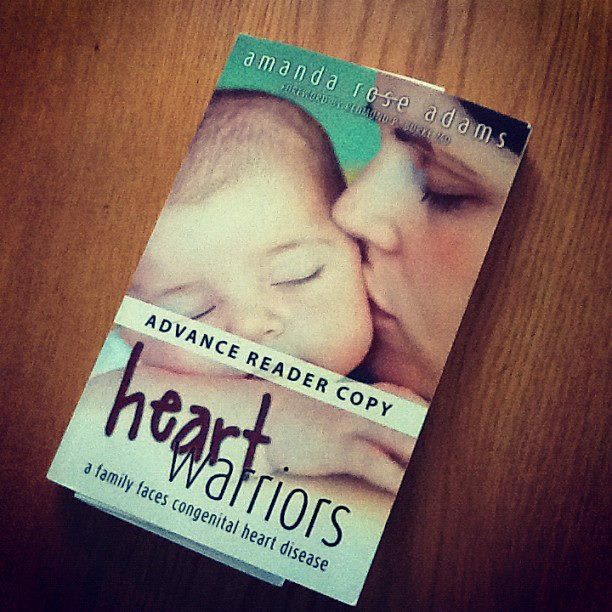 I would love this arc copy or any copy of this book as my daughter was born Nov. last yrar with HLHS and I would love to read about another family and how they live with a CHD in their life. I also want to start getting books that can help my Son learn how others handle CHDs in their families and can set it to the side of my Daughter. I would love a copy. My son Ethan was born 6/6/11. He was born with TOF along with Di-George syndrome. One month prior he was put on a NG tube for feeds . He had a piratical repair on 9/13/11. When he was six months old we found out he had a malrotation, a hernia I’m his rib cages. They were able to fix that. When he turned 11 months he was taken off the NG tube and was placed on thicken feeds. 4 weeks ago he was able to drink liquid with out any thing thicking it. He has been in Pt, Ot since he was 4 months and we are starting St. he was just put into braces and said his first word. Ma ma. He will have a few more heart surgeries date to be determined. I have thought of writing a book of my story and others. I want to thank u for doing it too. Im sure u will help millions and i would love your help as well. I would love to have a copy of your book. I am a heart warrior MOm and would love to read your book. Jennifer – Liam picked your number! Please email me your mailing address by Tuesday morning and I’ll mail you your book! Congrats!!! Would love a copy. My son Will has TA, TGA with Hypoplastic Aortic Arch, ASD and VSD. Will’s 18 now, but I searched and searched for a book when he was a baby, and none existed. I actually tried to write a book, but…well, I’m not a writer. Thank you for writing this!!! Through the magic of technology, while we have never met: we are former colleagues, we know each others journey and struggles better than 90% of our real life friends…and despite different diagnoses, different organs and specialists, through the power of technology (and awareness, fundraising, advocation and eduction) we are both the moms of two children not one child and one special angel. I would be honored to have an ARC with hopefully the addition of an old-fashioned, no-tech note and signature! I would love a copy of your book. Since having my son who has HLHS it’s really nice to read and be in contact with people who can relate to what we have been through. God bless all of our CHD children. I would love to have a copy of your book! My son Eli was born in November 2011 with aortic valve stenosis with a bicuspid valve. I had never heard of CHDs and it was foundafter he was born! I would love to read about others Journeys! I am also a heart parent. I almost lost my son, Sam. I enjoyed reading your book. It made me laugh; it made me cry. And after twelve years with Sam, it reminded me not to take life for granted. Thank you , heart sister! I would love to win a copy!! I’m a heart mom too! Jennifer – Moira picked your number! Please email me your mailing address by Tuesday morning and I’ll mail you your book! Congrats!!! i have not read the book yet but i sure would love to.I know it must a great book with all the people are saying.